George W. L. Novak of Nebraska City died Saturday in Omaha after an illness of two months. He had been a resident of Nebraska City since 1935. Funeral services will be held at 1:30 p. m., Tuesday at the First Evangelical Lutheran church with Pastor Louis Novak officiating and burial at Wyuka. Gude mortuary is in charge. Pallbearers will be Warren Hoffman, Marvin Eden, Gene Lenser, Gerald Hoffman, Carl Peters and Harvey Raben. There will be a complete military service at the graveside conducted by the American Legion. The family suggested memorials to the First Evangelical Lutheran church of Nebraska City. 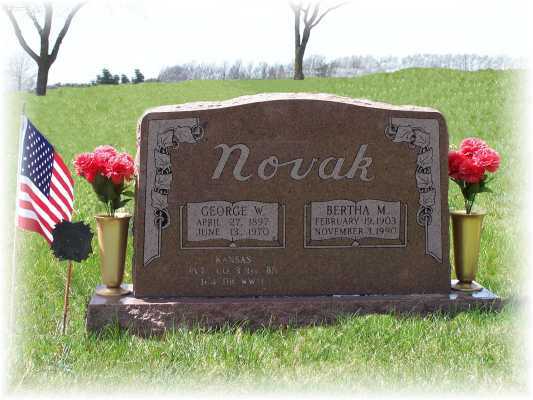 Mr. Novak was born April 27, 1897, on a farm northeast of Logan, Kansas, the son of Mr. and Mrs. Charles Novak. He was married at Logan, Kansas, to Bertha Maria Pfannkuch on April 19, 1922. He was a baker by trade. He was a member of the American Legion and the Lutheran church. Mr. Novak served in the army in World War I. Surviving him is Mrs. Novak and four children, Mrs. Marvin (Wilma) Eden, Fremont; Mrs. Warren (Viola) Hoffman, Wichita; Mrs. Gene (Loyetta) Lenser, Fremont, and Robert W. Novak, Omaha. There are 10 grandchildren and a great-grandchild. Also surviving are brothers, Carl and William Novak, Logan, Kansas; sisters are Mrs. Margaret Novak and Mrs. Ida Ehm, Phillipsburg, Kansas. A sister and his parents are deceased. Martin and Sophia (Roesch) Pfannkuch. She married George W. L. Novak at Logan April 19, 1922. He died June 13, 1970. Bertha, a former Logan resident, moved to Auburn, Nebraska in 1936 and then to Nebraska City in 1938. She was a cook and baker and was employed at the Club Cafe. Martha Circle in the church. Funeral services were held Tuesday, November 6 at First Evangelical Lutheran Church in Nebraska City with the Rev. Kenneth Foss officiating. Burial was in Wyuka Cemetery of Nebraska City, Nebraska. Pallbearers were Ed Flake, Edwin Harms, Alwin Meyer, Eldon Mitzner, Jerry Regler and Gerald Hoffman. Memorials are suggested to First Evangelical Lutheran Church in Nebraska City. Gude Mortuary was in charge of funeral arrangements.